Jen Scheer, a shuttle technician, takes pictures of the sunrise at Kennedy Space Center every weekday morning on her way to work and tweets them. CAPE CANAVERAL, Fla. ? The sun issetting on the shuttleprogram, and on Jen Scheer's career as a shuttle technician. But for the near future, the35-year-old Merritt Islandresident's focus is on sunrises. Each morning before work at KennedySpace Center, Scheersnaps pictures of day breaking and posts a favorite on Twitter andother sites. The ritual has won an internationalfollowing and become abook project, one that demonstrates the power of online socialnetworking andsymbolizes the promise of a fresh start after so much uncertaintyabout the space program. "It's a nice way to start the dayout," Scheersaid after taking dozens of sunrise photos earlier this week. "It'ssomething to look forward to." 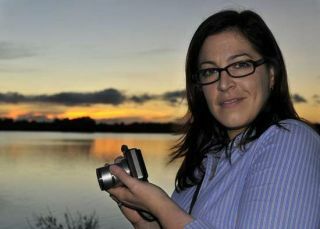 She began regularly shooting sunriseslate last year. Fanssoon began to demand the pictures. "It got to be where if I didn't doit, people wouldsay, 'Where's the sunrise? It didn't come up today,'" she said. Scheer left no doubt on Monday. A band of dark clouds hung low aboveLaunch Complex 39 asthe sun crept over the horizon at 6:56 a.m., transforming the center'sturnbasin into a pool of orange light. "Nice water reflections," said Scheer,shooing away the occasional mosquito. By 7:37 a.m. she had picked a picturewhose cloudarrangements she found pleasing, titled it "Reflective" and posted alink on Twitter. "While I was driving to work thismorning, I thought tomyself, 'Today's #dailysunrise should be stunning,' " tweeted33-year-oldDavid Allen of Palm Bay, or "DaveFlys." "I was right!" Scheer believes most fans simplyappreciate a pretty pictureeach morning. Especially during winter, some viewers don't get to seethe sunmuch. But for some, the location has special meaning. "I think a lot of it is theconnection with thisplace," she said. "A lot of people love the space center." Scheer already had a well-establishedaudience on Twitter,where she is known as "flyingjenny" and has over 3,000 followers. She founded the Space Tweep Society,a gathering place for Twitterusers who are space enthusiasts. Her tweeting recently earnedher a ShortyAward, which recognizes Twitter efforts. "We've only begun to see what you cando with the powerof social media," she said. "It's a great way of bringing peopletogether for different causes." Her network is proving helpful at adifficult time in hercareer. Scheer recently opted to take avoluntary layoff from thejob she's held for eight years servicing shuttle thrusters. Come Oct. 1, she'll be one of about900 local United SpaceAlliance employees out of a job. Thousands more will be let go when theshuttleprogram ends, but that date remains unknown as political wrangling overNASAcontinues. "You can't make plans for the futurewhen you have noidea when (the program) is going to end," she said. "I'm just readyto be in charge of what happens to me again." Long-term, Scheer hopes to start aneducational program thatwould allow students to work on a replica Mercury-era rocket at arefurbishedpad. For now, she's acting on friends'suggestions to turn thesunrise series into a book or calendar. She recently posted a book proposalon a site calledKickstarter, which collects pledges if the project's creator meets afundraising goal within a specified period of time. Scheer's goal: $6,500 within 15 days.The money would helpher produce electronic and hardcover versions of the coffee table-stylebook,and buy new photo equipment. Contributions from $5 to $500 rolledin, and she was halfwayto her goal within 24 hours. "I was thinking, this was a goodidea," Scheersaid. She reached the target last weekend,but can continue tocollect pledges through 5:33 p.m. today. Scheer plans to publish the book bythe end of the year orto coincide with the last shuttle mission, now planned in February. When she's no longer allowed insidethe space center gates,she'll continue to shoot photos from nearby locations. The project is mainly for fun, but itcould help her stayfinancially "afloat" for a period of time if successful. Even if it doesn't, it will serve animportant purpose inher post-shuttle life. "I think it will be difficult to getup knowing I won'thave to be at work," she said. "But it's a really good way of keepingmyself on a good schedule and not getting lazy."